According to earlier plans I had heard through Waterfront Toronto, Cherry Street Loop was not to be completed until after the Pan Am Games because the site is part of a parking lot for buses. Contrary to this story, the loop is under construction, albeit surrounded by a parking lot. The now-inactive Cherry Street tower that once controlled the eastern approach to Union Station sits at the south end of the loop. In the left background, behind the trees, is the GO Don Yard. The terrible irony about this, our possibly newest streetcar line, is that it won’t actually see service until Spring 2016, and the proposed extension under the railway to connect with a Queens Quay East line isn’t even in the current list of projects awaiting funding. Photo at Cherry & Eastern added. The intersection of Cherry & Eastern will be closed from Friday, August 2 at 9:30 am until Tuesday, August 5 at 5 am. This will allow reconstruction of the intersection including the installation of streetcar track. Updated July 21, 2013 at 6:00pm: Photos added. 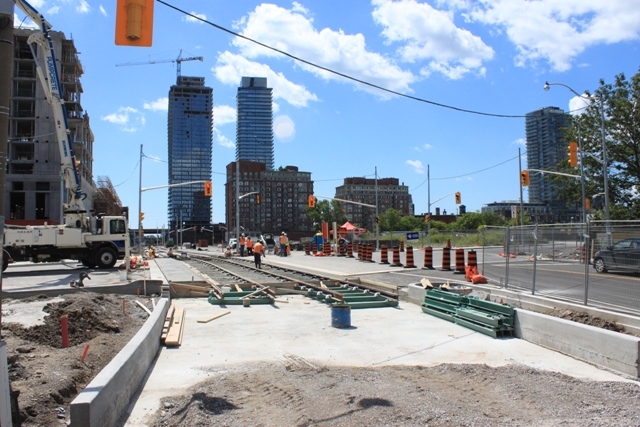 The first streetcar line into the eastern waterfront began to appear recently with the reconstruction of Cherry and Sumach Streets south of King. Pre-welded track strings for this section have been waiting for over a year, but are finally moving to a new home in the middle of the new “Canary” district. The West Don Lands, a long-fallow area of abandoned and polluted industrial sites, will become the Athletes’ Village for the Pan Am Games in buildings that will become a new “condo village” once the games are over. 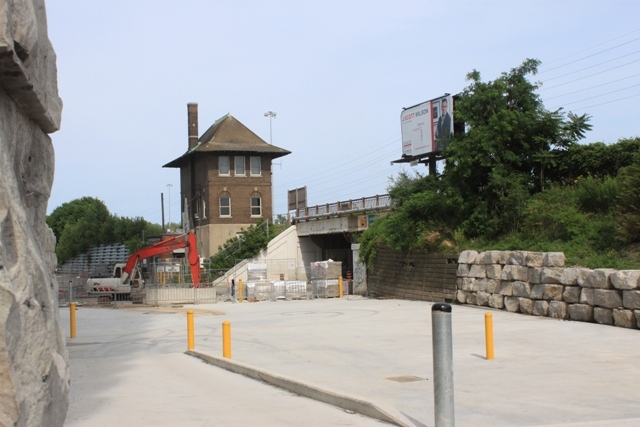 The Cherry Street branch off of King Street will run south to a loop just north of the rail corridor immediately north of the old Cherry Street “tower” for the eastern approach to Union Station. On March 30, 2013, the new Cherry Street was just beginning to appear. Here we are looking south from Eastern avenue. The traffic signals are at the future intersection with Front Street where the old hotel that housed the Canary Restaurant sits on the southeast corner. The concrete in the foreground is the base for the new roadway, and the space east of that will become the streetcar lanes. Further south at the rail corridor, the Cherry Street tower sits alone. By July 16, track had been placed on the east side of Cherry and construction of new buildings is well underway. By July 21, the track has been assembled. Also visible here are the covers of pits under the future sidewalk that are designed so that tree roots will be able to grow properly. 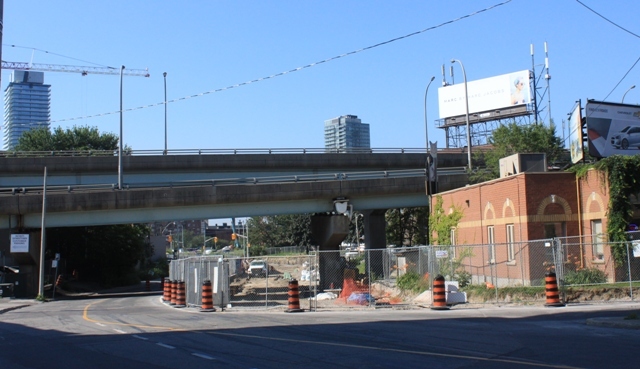 Looking south from King Street on Sumach Street under the ramps linking Eastern Avenue and the DVP to Richmond and Adelaide Streets on July 16. 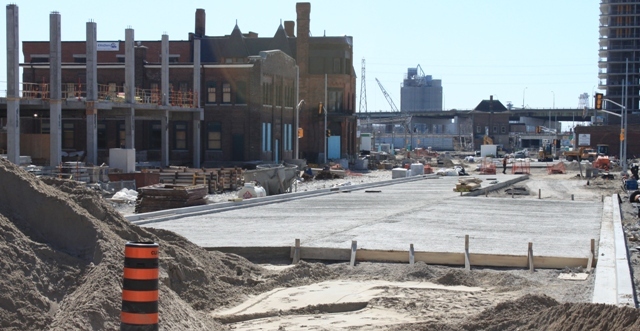 Construction of the new Cherry Street roadway is in progress. The space on the left (now paved) will continue the streetcar corridor north to King. The connection to King will be installed in 2015, and the line will become active in spring 2016. The old Canary Restaurant Building started life as a school. It is designated as: Palace Street School, 1859, Joseph Sheard, architect; 1869 addition, William Irving, architect; 1890, addition for D’Arcy Hotel, David Roberts Jr., architect; 1891, addition completed by Sproatt and Rolph, architects; 1906, became Cherry Street Hotel – adopted by City Council on August 18, 1976. Traffic signals are in place at the future intersection of Cherry and Mill Streets, and the streetcar track is visible in front of the hotel. 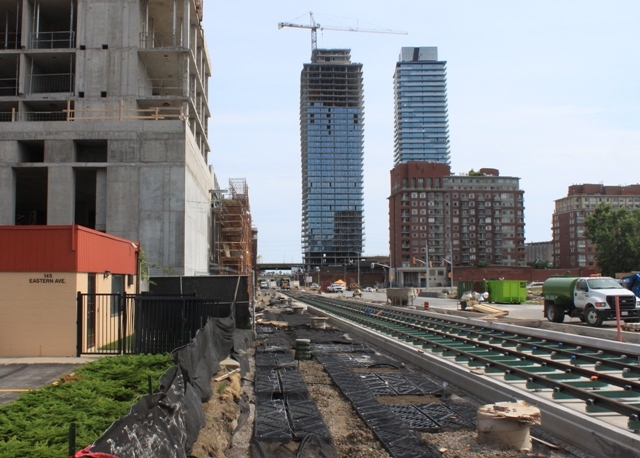 Another view from the southwest with the TTC Streetcar Way tent in the foreground and new buildings sprouting in the background. This route will not come into its own until a connection south to Queens Quay East, a project that does not have a firm date or funding. 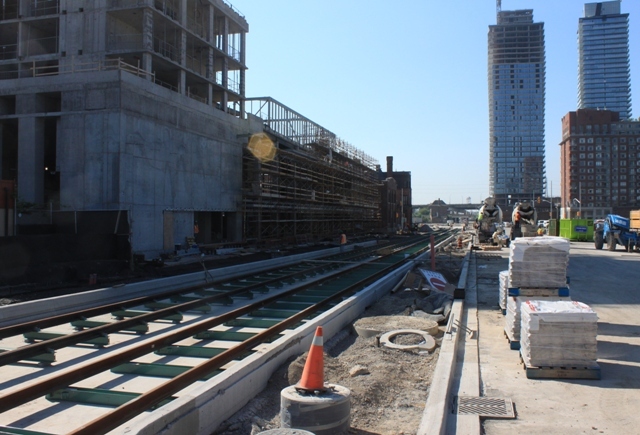 The view below looks east to Cherry Street Tower on the north side of the rail corridor. The streetcar loop will eventually go just to the north (left) of the tower. The Cherry Street underpass must be widened with an additional span to give enough room for streetcars, autos, cyclists and pedestrians to fit under the rail corridor to Lake Shore Blvd. This entry was posted in Waterfront. Bookmark the permalink. I didn’t know work on the line had begun. Wow. That’s good news. Steve, isn’t the line supposed to be ready for the Pan Am games? At least as a temporary basis? I’d certainly hope we don’t end up using bus ferries to King Street. Additionally will street cars servicing this spur come from the east or west. I.e. servicing to and from downtown and Dundas West or to and from Broadview and Danforth? Steve: This area will be a closed precinct for the games as it will be the athletes’ village. There is no competition venue, and no need for public access. The intersection at King will have curves to both directions, but the service is planned to run into downtown. A service from Broadview Station would make sense once the connection under the rail corridor to Queens Quay East is built giving an east side version of the Spadina/Harbourfront routing. Great pictures. Looking forward to how these side-by-each configurations work. Wait, isn’t the Pan-Am games in 2015? Steve: This street layout is the similar to what is under construction on Queens Quay with the road and transit lanes separated. The idea is that eventually it will be one continuous design from Queens Quay East around onto Cherry. – The whole area of QQE, Parliament South, Cherry South integrated to Cherry in the Portlands. Originally during the public consultation on what is the current Leslie Barns location choice, I submitted both the current location and the possible service of any new streetcars along Commissioners or Unwin (the ultimate). I heard from somewhere that the northern Cherry bridge would have been an issue with tracks, then I took some pictures of European bridges with tracks. Not a problem. Even the south Cherry bridge. In fact, the cars could loop around the Cherry Beach Loop. Down around the Hearn station, they could have some serious side-by-eachy trackage. Well, if anything, it’s demonstrated that the potential is there. I so want all of this to work. One thing I wanted to ask though. This picture. Is that enough for a finished line? I know it’s minimal, but it allows for off-site prefabrication of stretches of track, quick development of trackbed, and perhaps a large conduit for fibre and electrical underneath. Steve: The whole area will have utilities under the roads. These were built before the road slabs went into place. All of the eastern waterfront is being wired for high speed network connectivity. For more details about the layout of Cherry Street, please go to the project page on Waterfront Toronto’s site and look at the EA document. Just curious, was consideration given to using the ROW under the Adelaide/Richmond overpasses between King/Sumach to turn eastbound cars to Sumach? Looks like just enough room to for a single track between the overpasses. Steve: I had suggested a connection through there, but it is tight for double track. At the time, it was a parking lot and there was strong local opposition to losing this. Then the property to the west went up for sale, and the parking vanished, but the design stayed on Sumach Street. Will the new service go all the way to Dundas West or is the plan to turn back before then? Steve: No idea. The TTC hasn’t gotten that far. I would not be surprised to see a western terminus at, say, Dufferin to provide additional capacity to the Liberty Village and Bathurst/Niagara neighbourhoods. It’s good to see that this is under construction! I believe it’ll be the first new streetcar service south of Bloor in some time. It’s sad to see the vast amounts of millions squandered on cancelled/delayed LRT projects in the suburbs when there are places downtown (East Bayfront, Queen’s Quay East) that are hoping to someday have even a streetcar line! Before giving my additional comments, I will wait for the full details of this project. Seems like a great idea. Hopefully Queens Quay East can be a linkage so that area can really have full access of transport. Thanks for the great track construction photos. Question related to the second photo to help me understand the new track construction standard: do I understand correctly that what we see in this photo is the “permanent” concrete and tie installation (plus the track)? So when the rebuild is needed, they will chip out the second layer of concrete to get back to what we see in the photo, then replace the rails and finally pour a new top layer of concrete? Also, will there be anything separating the two concrete layers or does pouring new concrete on dry concrete simply not bond so they can easily chip off the top layer? Steve: Typically a thin layer of tar is sprayed on top of each slab to provide isolation from the one above. In the second photo, the track and ties are sitting on the foundation slab. The next layer of concrete will be up to the top of the ties leaving the attachment points for the Pandrol clips exposed, and the top layer will include the track and the rubber sleeve isolating it from the concrete. For track replacement, only the top layer is removed, the old track is unclipped from the ties, new track installed, and finally a new top layer of concrete. This has already happened with some carstop replacements within a “new” section where the track wears faster with cars stopping and starting. The most recent example is westbound on Queen at University. 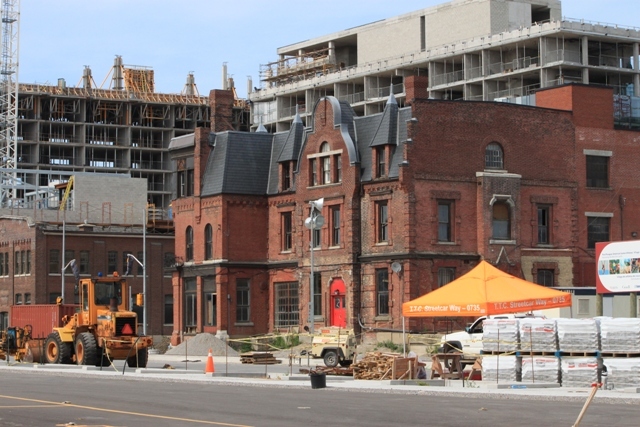 In this photo from the York Street construction article, if you look in the background, the section of open ties does not go all the way to the corner. The eastbound rail is not excavated at all, and the westbound rail only is open for the top layer. Other parts of the site are in various stages either open down to the foundation, or with the second layer of concrete in place. Thanks again for the details. I’m sure you explained before but I missed that there are actually three layers of concrete, not just two. Now I cannot help but ask, what is the expected service life of the bottom layer of concrete? Might it be, say, 100 years, a duration I seem to recall hearing in a different context? That would sure be a nice “in your face” detail if so. And no leaks from above to worry about either! Steve: I don’t know if there has ever been a lifetime predicted for the foundation slabs or for the middle layer with the steel ties. They will certainly last two cycles giving a lifespan of over 50 years, probably more depending on how much salt penetration there is from the roadway. Great photos. I think the concept of side-of-the-road streetcar running is going to be interesting for Toronto to experience. I suppose that there will be an adjustment period but people will probably be much happier with the new approach and streetscape. I’m curious about how much money it would cost to build that ideal waterfront “LRT” (really a streetcar) network…if I recall correctly you mentioned a budget gap of $250 million (or thereabouts) for the East Bayfront Line. Steve: The Waterfront East line to Parliament has a budget that is now over $300m, but much of this is due to the complexity of tunnel work both at Union and at the eastern approach from Queens Quay to the Bay Street tunnel. As for side of the road running, we will see that early next year on Queens Quay West. The Waterfront East line to Parliament has a budget that is now over $300m, but much of this is due to the complexity of tunnel work both at Union and at the eastern approach from Queens Quay to the Bay Street tunnel. A number that is probably going to increase over time since it will require another shut down of the Queen’s Quay section of the line to Spadina … not to mention the work that will need to done to reconfigure the Union loop. It is truly surprising that there was no coordination of funding and priorities so all the work could be done more or less together. The East Bayfront needs a few councillors to champion it along with Waterfront Toronto, rather than taking a wait and see approach. Steve: The local Councillor, Pam McConnell, and the MPP, Glen Murray (now Minister of Transportation), have both championed this line. Yes, it’s a shame that the work at Union was not undertaken concurrently with other construction in the area. However, I’m not sure that this will require a shutdown except for relatively short periods as much of the work can be done “behind the walls” of existing operations. Funding is included in the new Development Charges Bylaw that will be considered by Council later this year. I don’t know if it is a coincidence or an example of irony but Metrolinx & GO Transit appear to have vacated their offices at 20 Bay and moved to Union Station. I know they don’t have much say in waterfront transit but it would have been great if someone from Metrolinx had the idea to help fund that portal. Steve: Co-incidence. They had always planned to move once renovations of the West Wing offices were completed. Something to look forward to. Maybe it will inspire people to give the same attention to the East Bayfront Line. Looking at renderings of the proposed athletes village/future residential development, it strikes me that there may be a future opportunity to utilize Front/Wellington corridor to service Cherry Street streetcars, rather than King St which is already quite busy. I realize the connection south of the rail corridor has greater long term benefits, but realistically speaking, how long do you think it would be until we could plausibly see construction of this next stage? Steve: There is no point in putting track on Front from Cherry to Church that will only duplicate the connection via King. Westbound cars could run through the core on Wellington, but eastbound cars would have to return on King anyhow at least to Church. There would also be a problem with the median of Front between Church and Jarvis, and the frequent congestion/closure of Front near the market. Due to the potential congestion issues at Broadview Station with the Dundas and King cars, I wonder if it might be worthwhile to take a look at restoring the Parliament line if the goal is to create an east side version of the Spadina/Harbourfront routing. Steve: Parliament will not be restored because Castle Frank Station’s structure was not designed to support streetcars. Also, it is a painfully slow trip thanks to many traffic lights that work against the transit service, and have done so dating back to when there was a Parliament streetcar. 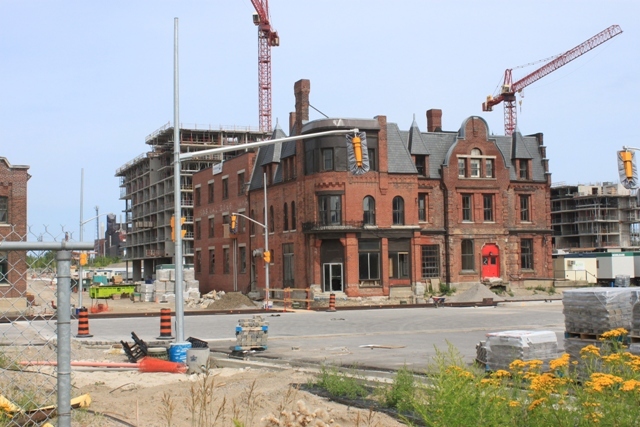 Parliament will not be restored because Castle Frank Station’s structure was not designed to support streetcars. Also, it is a painfully slow trip thanks to many traffic lights that work against the transit service, and have done so dating back to when there was a Parliament streetcar. Actually, I was thinking the real deal killer would be that no one would want to put streetcars back on Bloor and the cost of tunnelling under Bloor and completing the subway deck over Rosedale Valley would put an end to the idea quickly. I never did considered the traffic light issue. If/when the tracks are extended under the rail corridor, will the loop be removed? Steve: It is described as a “permanent” loop, and I suspect that it will stay. It is described as a “permanent” loop, and I suspect that it will stay. Frankly, it seems pretty silly to create a ‘permanent loop’ north of the rail corridor. At least initially the Queen’s Quay East LRT will probably end at Cherry (or even Parliament) and thus need a loop there. Seems unnecessarily expensive (in both ‘wasted’ land and special track-work) to have two loops within a few hundred yards but then many things in what passes for transit planning around here do not seem too sensible! Steve: The problem is simply that funding even for Queens Quay east, let alone the Port Lands and the Cherry connection, is far from certain, and a “temporary” loop may see years of service. Even after the connection is run through, the more likely one to vanish will be at Parliament and Queens Quay because of the road realignment east of there. Hope this trackage will not be a rehash of Runnymede Road. I could see many of the downtown thoroughfares having side of the street streetcar right of ways. I imagine the tracks would only have to shift back to the centre for track junctions for proper clearance. I also saw a drawing somewhere where the same thing could be done on say a one way street like Richmond with one side of the street for bike lanes. Maybe having the King streetcar with a side of the street right of way could be done to maintain some degree of traffic allowance while finally giving the 504 the ROW it’s needed for some time. Am I the only one with these ideas, and is it possible? Steve: The tracks are not going to be in the curb lane anywhere downtown for reasons already discussed: problems with curves at intersections, and the near impossibility of banning access to curbs by motor traffic 100% of the time. If we were serious about moving vehicles downtown, we would simply ban parking, standing and stopping to free up the capacity of those lanes, but as a city we cannot even do that. Toronto should concentrate on making the streets it has work better before a undertaking massive reconstruction of the streetcar system which would then be blamed for the upheaval. Also a commenter above mentioned something like a decking provison for future subway service by the Rosedale valley Bloor overpass at Parliament. Is this similar to the one for the Bloor Viaduct? Thanks. Steve: The bridge over Rosedale Valley east of Castle Frank Station is structurally similar to its larger cousin, the Prince Edward Viaduct, and has openings for a future subway. They were not used because the curve that would have been required at Parliament Street would have been too tight for a subway line. Instead, the new covered bridge just west of the station was built to carry the subway around a gentler curve. Just out of curiosity, why does it always smell down by Lakeshore & Cherry? It’s an old-school industrial smell that doesn’t want to go away. I thought someone might know what that is. There used to be a “tank farm” there and the ground is contaminated with petroleum products. Decontamination is yet another challenge for redevelopment, as it was in the West Don Lands and elsewhere in these formerly industrial areas. Steve, isn’t the Cherry line too short to be meaningful or are there any plans to extend it in the near future? I like that it has it’s own right of way built in but at only 700m it is probably faster to walk than to wait for the streetcar. Steve: This will only come into its own when the connection to Queen’s Quay happens in the future. This will allow cars to operate from the Port Lands (when that extension goes in down Cherry to the Ship Channel). It would also provide a link to the Danforth subway (via King, Queen and Broadview) from the waterfront. Sadly, this part of the project always gets put on the back burner in discussions of funding even though it is critical to the overall waterfront east network. Why is it so difficult to loop every nth King car down Cherry Street? What am I missing? Steve: You’re missing nothing at all, and that is probably the service we will see, or possibly a separate route from, say, Bathurst or Dufferin to Cherry overlaid on the King service. I am not sure if the whole loop is actually being built – they certainly laid rail into and out of it and erected poles but it appears to me that no work is currently going on to join up the two and the poles do not ‘link up’. It’s quite hard to see exactly what’s going on and I must say it makes little sense to me not to finish the loop properly. As far as I know, the section between Eastern and King is supposed to be done next spring. When you were involved in designing Cherry Street, did your panel consider making it like the Queens Quay proposal — that is, with the bike path to one side of the streetcar lanes, and car traffic to the other side? Hate to be that guy, but it seems like a missed opportunity. Steve: The pedestrian space on the east side of Cherry is narrower and there isn’t room to have a fully set off pair of lanes as on Queens Quay. It was a big fight just to get the transit right-of-way on the east side rather than in the “traditional” middle of the road location. I AM amused that the name “Cherry” is associated not only with Don Cherry, who so wonderfully (not!) rudely highlighted Mayor Rob Ford’s inaugural ceremony, but also with a street upon which now streetcar tracks (HORRORS!) are being laid! What an irony! Cherry Tower is still in active service! Steve: Thanks for the correction. I thought it had already been decommissioned. I like the right of way but one in the middle is faster than (1) both directions on the same side and also the middle one is faster than (2) each direction on their respective curbs (difficult to describe in writing but I guess you got what I mean). But any right of way is better than no right of way. Steve, any hope that Broadview might get it’s own streetcar right of way? Steve: Four lane streets are non-starters for rights-of-way. There is no way the street can operate with only one lane of traffic in each direction and, frankly, there is little need for a right-of-way there. Yes, things can get congested around Gerrard at times, but nothing like congestion elsewhere in the city. That’s no reason to take over the lanes on a 7×24 basis. But soil cleanup has been dealt with. The soil treatment facility is down on Unwin Ave. Lots of the soil on this site was dealt with. I still smell this stuff down there. If it’s not dealt with now, it will be there for some time to come. I had originally thought it was just historical land poisoning, but nothing that couldn’t be cleaned up, given the right facilities. Will the loop, after the tunnel is completed and it is joined from the south, loop from both directions, thus suitable to short turn both King and QQ cars? Steve: No, the loop is designed for access only from the north. Whether the “interim” loop at Parliament on QQ will survive after the extension into the Port Lands is built remains to be seen. If the Cherry Street Loop is finished before the Pan-Am games, does that mean the TTC could be looking to move up the start of service date or is there still something that needs to be done first that is scheduled to start only once the games are finished? Steve: In theory they could start service early, but I doubt this will happen. In any event, it would shut down for the duration of the games because the Athletes’ Village is a secure area with no public venues. In theory they could run service to the loop during the pan am games. If I recall correctly during the Cold War a bus served CFB Downsview however upon reaching the gate anyone without clearance had to disembark. Steve: But there is no point in running service there if there will not be any demand. Steve: The terrible irony about this, our possibly newest streetcar line, is that it won’t actually see service until Spring 2016. Given that the Athlete’s Village is a secure area I suppose that organizers might wish to run ‘tour’ streetcars to bring VIPs to the Athlete’s Village or bring athletes out to see Toronto, but that will be it. Still, with all the complaints and rancour about streetcars, it would be nice for Toronto to get a ‘sneak preview’ of a different type of streetcar in a different setting before service is shut down for the games. Are they really going to construct the entire Cherry loop this year? It looks more and more like they are not building the southern half of the loop. Steve: Don’t know yet, but the original story was that the whole thing was to be part of the parking lot which surrounds the loop. To me, it’s looking more and more like the south side is not being built … and I’d guess it’s the temporary access road to the parking lot, which is now paved.